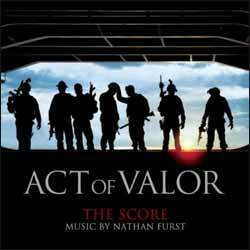 Nathan Furst's orchestral score for Act of Valor is well worth picking up if you're a fan of action/suspense based soundtracks. The easiest way of describing it is that it feels very much like a modern James Bond soundtrack, but with all the bland elements stripped out. The album contains 20 original cues from the movie, lasting 1 hr, 08 min, 20 sec. While there isn't a bad track, personal favourites include the beautiful ('Ethos', 'Act of Valor', 'Bonfire', 'The Calm After' and 'Engle's Legacy (Funeral)') and the suspenseful ('SWCC Boats', 'Kill Box', 'El Centro Cartel' and 'Milk Factory'). If this is typical of Furst's work, then he's certainly a composer worth looking out for in the future. He knows how to deliver when it comes to scoring for both action scenes and touching moments - something even some of the most established composers seem to have a job handling quite as easily. Another bonus for me is that Furst's work delivered something rare for me. I've been reviewing soundtracks for years, and have been a collector since I was a teenager, and so I can pick up on the most tenuous of musical cues from other composer's works. With Furst's work here it all felt truly original - there wasn't any other score I'd heard that sounded remotely like this, nor could I compare it to any other composer's work. This is original in it's feel, while staying true to traditional orchestral scores. Furst's attention to detail is impressive. How many times have we heard 'Taps' being played in movie's to signify the passing of a member of the armed forces who has died heroically? It's pretty hard to top this, but Furst adds a few notes to underscore the familiar bugle call. The result is an even more emotionally charged segment of music. It's a brave gamble that pays off wonderfully. Even if you haven't seen Act of Valor you should seriously consider tracking this album down. The emotional benefits are well worth it.